Hey Michael. I'm stuck. I have a legacy ASP3.0 application that had to be moved to a Windows 2008 R2 server. I have been through all of the steps to enable classic ASP (classic application pool, 32-bit enabled, permissions seem okay, etc.) but I can't get past a 404.17 Not Found error when trying to access a test.asp page. It says "HTTP Error 404.17 - Not Found The requested content appears to be script and will not be served by the static file handler." Any ideas? For classic ASP, the server roles that you will choose are under development and are ASP, and ISAPI. Those are the roles required for classic ASP.On the page that I gave you a link to, you&#39;ll see one section on the page that says &quot;Install Classic ASP Workload&quot; which is what you&#39;re referring to. That step was one of the first ones I did. Without those roles, I was getting 500 errors. Now I'm getting 404.17. See attachment to confirm that we're on the same page. 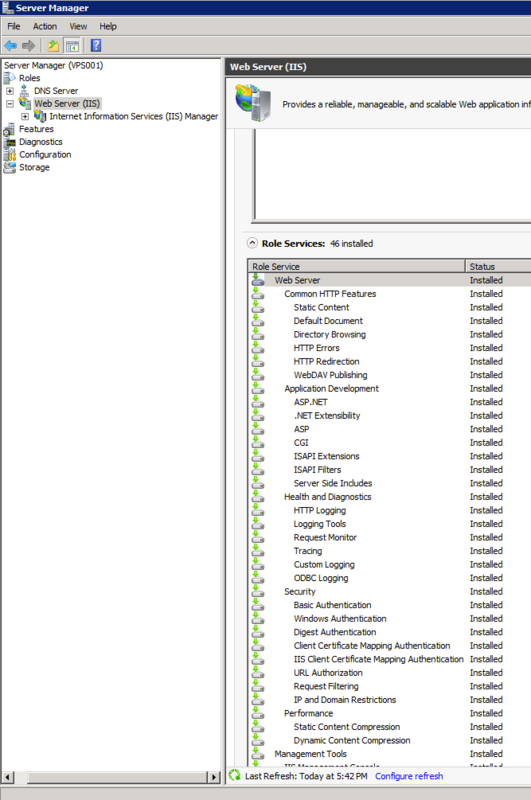 All of the roles under "Install Classic ASP Workload" have already been installed. From what I understand, serving static content is handled by MIME types configuration and serving dynamic content is handled by the "Handler Mappings", which already is configured. See attachment for this info, too. Please let me know what I ought to try next. I really need to get this figured out by tomorrow night. I have enabled it and rebooted (tried restarting site first) but nothing has changed. The disturbing part is I can't see any request anywhere in any logs. C:\inetpub\logs\LogFiles has nothing since 4/29. Nothing in the Event Viewer. I am trying to request this page: http://mysite.com:80/test.asp (the error page automatically adds ":80" to the message, I know HTTP and :80 are redundant). The physical path is here: C:\Inetpub\vhosts\mysite.com\httpdocs\test.asp This file exists in this location for sure. I had tried enabling "Failed Requests Tracing Rules" per another post but I don't think I had any success with that because that log is empty as well. How do these look? IUSR and IIS_IUSRS perms are highlighted in the attached screenshots. 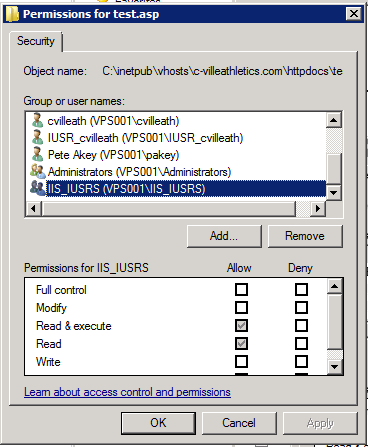 I used to know how to view what user the site is running as but don't know how in IIS 7.5. All the posts I read said include these users. I checked all the parent folders to inetpub (inetpub/vhosts/mysite.com/httpdocs) and these two users have read & execute, read, write on all of the folders and read & execute and read on the file itself. The error states "The requested content appears to be script and will not be served by the static file handler". Please advise. I can't paste into JustAnswer box for some reason so output is attached. Hmm...I don't see that option, neither in the right-click context menu or on the right in the Actions pane. aspx mapping for Classic ASP? Actually, there are many mappings you are missing.... you have asp for 64 bit, but not 32 bit.Reverting mappings should correct them all. Oh, I see a "Revert to Parent" inside "Handler Mappings" for each mapping. Do I do each one individually? What properties does the "parent" have? What is the "parent"?Okay, I reverted to parent and it does them all. 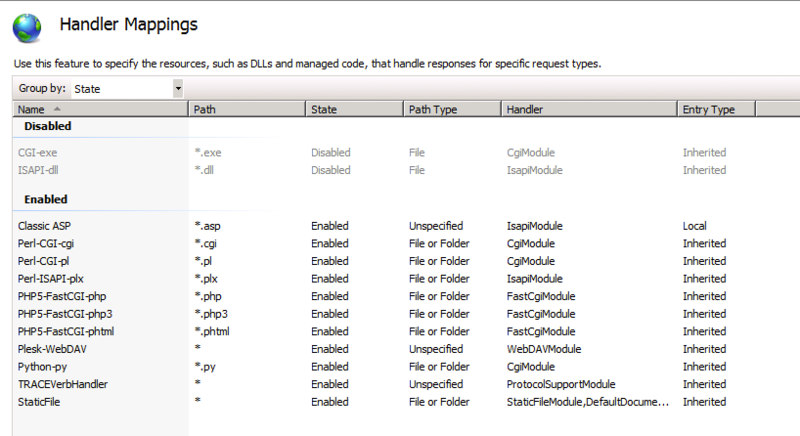 ISAPI-dll is disabled again. Do I need to enable?Okay! Now I'm getting a "normal" ASP 3.0 error...sort of what I'm used to. If I need help with that, I'll be back. I think I can get started down this path. Thank you. Great news! Yes... it&#39;s easier from here.